I liked the television series “Cosmos” when it first came out. I didn’t realize how intent it was on replacing faith in God with scientism. I mean, the Ship of the Imagination was way clumsier than how God could see all of that: instantaneously, at any scale, and with perfect understanding. Even so, the program’s leading edge special effects, epic music with just the right mix of newfangled synthesizer and classical, plus Carl Sagan’s poetic wording inspired wonder and awe at “everything there is, or was, or ever will be.” It was the best sci-fi on TV, except it wasn’t fiction. The new Cosmos reboot doesn't live up to Sagan’s original. The music is canned and the CGI is cliché and low quality. The writing that isn't Sagan's falls a bit flat. And the subtle scientism is now a secular sledgehammer suggesting that we can’t appreciate the wonders of the universe until we let go of our primitive dogma. It’s as if some profit-mongering corporation were trying to capitalize off of Sagan’s work while supporting someone's anti-religion agenda. Oh... right. One of the things that both versions stress is that we are rather insignificant in the bigger scheme of things. We are not special. They wrongly assume that one of the reasons religious people believe in God and a creation is because they want to feel special. This may be part of the experience for some people, but for others it’s not an issue at all. So what if we are made of the same stuff as everything else. I love that quote. I may frame it someday and hang it on my wall. But Sagan is hardly the first person to voice such words. Thus we come to see that if our bodies are made of star-stuff — and there is nothing else, says the spectroscope, to make them of — the loftier qualities of our being are just as necessarily constituents of that universal substance out of which are made whatever gods there be. Now, what do you think was meant by the “dust of the earth”? Is it bits of ground up rock, particles of dead skin and other organic debris? This stuff would have been the smallest particles visible to ancient unaided eyes. They would have been familiar with growing things in the dust and things decomposing into dust. At that level it makes perfect sense. But it also makes perfect sense at the scale we can discern in these modern times. The smallest particles we know, those tiniest building blocks of all creation are subatomic. Subatomic particles combine (in the hearts or deaths of stars, no less) to create atoms, the basic elements from which everything in the world is formed, including the molecular machinations of life. Organs are made out of tissues, which are made out of cells, which are made out of cell parts like the cell membrane, the nucleus with its DNA, ribosomes and mitochondria. But what were those organelles made out of? I vividly remember the day my high school biology teacher passed out packets in preparation for the unit on cells. On top was a sheet showing the structure of the cell membrane. That was the day I fell in love with biology. Finally, I was seeing what life looked like at the molecular level. Until then, there’d always been that gap between atoms and molecules and cells. We've all heard the phrase "like oil and water" and we've all experienced how badly they mix. No matter how much we try to whisk that oil (or butter if we’re feeling dangerous) into the milk when making pancakes, it always separates itself into tiny, then larger and larger golden globules. This happens because oil molecules are non-polar while water molecules are polar — that is, they have a negative charge on one side and a positive charge on the other, giving it poles like a magnet, or the Earth. All oil and fat molecules (lipids) have no such “poles,” making them water phobic. The molecules that make up cell membranes are really big. So big, that they can have one part of the molecule that has poles, and the other part that doesn’t. 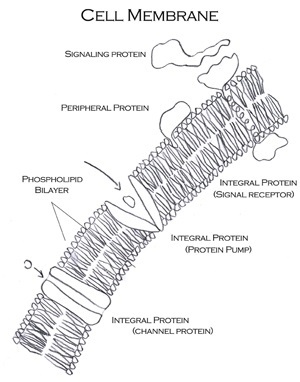 Cell membranes are made from phospholipids that are just that kind of molecule. The phospholipid molecule has the “phospho” head part that likes to mix with water because it’s somewhat polar. Then the molecule has two long lipid tails that “hate” water. A bunch of these molecules arrange themselves so that they’re in a double layer, with all the lipid tails directed inward and the phospho heads in a layer on the outside. This is one of the most amazing things. I wish there were more science shows delving into the deep smallness of life. This membrane lets smaller molecules like water and salts in and out all by themselves, but for larger molecules like proteins, other molecular gateways are imbedded into it. The simplicity and adaptability of the cell membrane has always struck me with wonder. All life depends on this ability to be protected from the environment around it while being able to give and take exactly what it needs from that environment. And that all depends on how electrons and protons interact with each other, which depends on the basic forces of nature, which depend on the will of God. The cosmos and its planets, the mountains, the rocks and the dirt and the tiniest quantum grains are all the stuff of God, divine dust that obeys without question, without deviation no matter how long ago the command was given. That is what we are made of. May we, someday, be as great as the dust.